For fans of Social Distortion, Johnny Cash, the Supersuckers, and Jerry Lee Lewis, the Hard Luck Heroes sing about the struggles and prosperity in their blue collar lives, hitting the road, and Texas. A heavy dose of improvised lead guitar, sing-a-long backing vocals, and moonshine are standard at their live show. For special occasions and the CD, members of the San Antonio Fire Department Pipe and Drum Brigade add bagpipes, creating a very cool mix of traditional piper songs and rock’n’roll. Five years ago, frontmen Josh Frandsen and Chris Young met while starting their careers in the San Antonio Fire Department and started the band by writing blue collar songs inspired by their work and influences in punk, old country, and rockabilly. 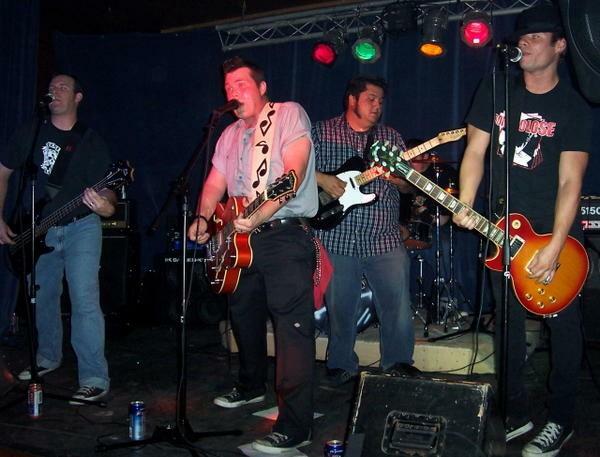 After gigging for a year, the band (now a 4 piece) needed a lead guitarist to properly execute a “punk vs. metal” tribute performance as Social Distortion. Old friend Michael Botsford was enlisted for the tribute but would only play if they also took on his old drummer from the Rummies, Rob Cadena. For the next few years they played all over Texas, opened for many large and underground touring bands, gave away hundreds of demos, and shot a music video before recording their debut album Broken Hearts and Shattered Dreams at Edit Point Recording Studios, produced by Michael Botsford.